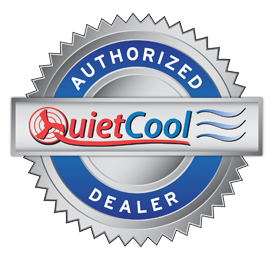 Anytime it is cooler outside than the inside of a home, the QuietCool whole house fan system will work effectively. In the summer, this normally happens in the late afternoon to early evening and through to the next morning. Where you aware that the average nighttime temperature in Chittenden County during the months of July and August is 64 degrees? As it gets later in the evening, and even cooler outside, we recommend opening more windows in other rooms of your home. Then at bedtime, close all the windows in the home except those in the bedrooms that are occupied. This will provide each room with a cool breeze as long as needed. One large centrally located fan can cool the entire home, but bedroom doors would need to remain open. If a QuietCool is installed in each bedroom, the occupants can enjoy the breeze and their privacy with bedroom doors closed.